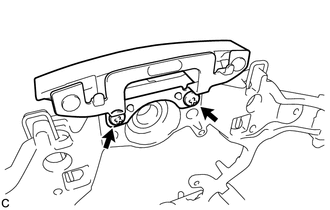 (a) Remove the steering wheel assembly set nut. (b) Put matchmarks on the steering wheel assembly and the steering main shaft. (c) Disconnect each connector from the spiral cable sub-assembly. 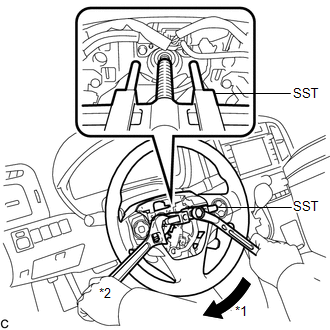 (d) Using SST, remove the steering wheel assembly. Apply a small amount of grease to the threads and tip of SST (09953-05020) before use. Do not rotate the spiral cable with the battery connected and the ignition switch ON. 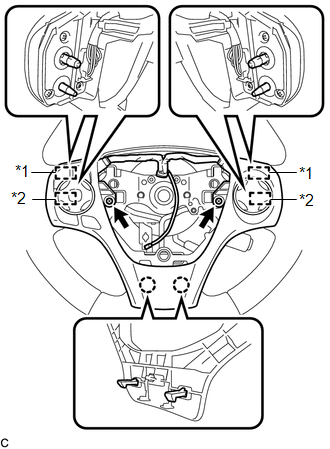 (b) Disengage the 2 claws, 2 pins and 2 guides to remove the steering pad switch assembly. 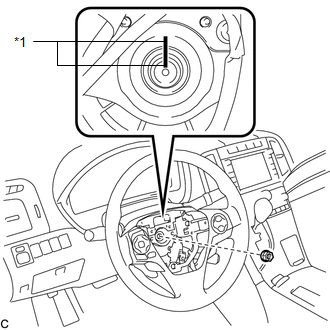 (a) Remove the 2 screws and steering shake damper from the steering wheel sub-assembly.